Research has shown that many older people experience significant hearing problems but they often fail to get the treatment that could help them live easier lives. A study in the UK carried out nearly ten years ago revealed that although over a quarter of all people over 75 could benefit from a hearing aid, less than half of them had been fitted with one. Of those who did have one, only 6 in 10 actually used them. Most people who fell into the category reported that their hearing aids just didn’t make any difference. The study was one of the biggest ever conducted, and it questioned nearly 35 000 people about their hearing problems and gave them a quick hearing test. Very minor hearing problems were often not recognised by those affected but the elderly did recognise and accept that their hearing was failing and nearly 10 per cent reported that it was a major problem in their lives. The problem definitely worsened with age – as would be expected. How Can We Improve Ear Health in Older People? There have been no similar sized studies or surveys since 2002 but there is no evidence that things have improved dramatically. It can be difficult to obtain the smaller, more high-tech hearing aids on the NHS and elderly people generally find it hard to argue their case. We in the UK could perhaps learn a lot from a scheme that has been running in Norway over the last couple of years. There, the Norwegian Association of Hearing Impaired People has set up a support network for people who need to have a hearing aid. The scheme has 400 active participants, who are themselves coping with hearing problems. They are based at 55 centres around Norway and visit people identified as having hearing difficulties to help them adjust, learn to use their hearing aid effectively, and provide support and information about ways to improve their everyday lives. Are People Afraid to Admit Hearing Loss? Another study, this time in the USA, revealed that the worry and stigma associated with hearing problems, which has been a significant factor in the past, is improving. This study showed that over 60 per cent of older people questioned did feel it was OK to admit they had a problem with their hearing. A much smaller percentage – less than one in 20 – had an obvious hearing impairment but resolutely denied it. The study concluded that this change in the way people view their advancing hearing problems as they get older could be due to the greater acceptance of the elderly in society. Although ageing is still not welcomed, the demographics in all industrialised countries mean that the number of elderly people we have in our populations is growing. People are living longer, and are remaining active longer. Physical problems such as hearing difficulties are bound to increase and must be addressed. In the UK, the first step is to go and see your GP to get a hearing test to see how bad your hearing loss actually is. If your GP agrees that you may have a problem, you will then be referred to a specialist – either an ear, nose or throat consultant, or an audiologist. In the NHS system, there is a waiting list for appointments, or you can choose to go private if you have the right insurance, or can afford to pay. Further, more detailed tests will then show what is causing your hearing problem, and whether a hearing aid would help. Different types are available – under the NHS system some people believe they will end up with the cheapest type, which is plastic and worn behind the ear but this is not necessarily always the case. If you cannot benefit more from another type, getting the cheapest one makes sense but if there are sound medical reasons to suggest a more sophisticated hearing aid would help, you should be able to get one. Bone conduction hearing aids are now available, which fit onto a headband or glasses and connect with a hearing aid worn in or behind the ear. 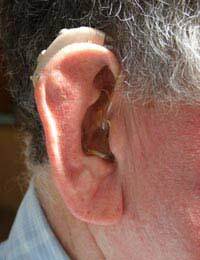 It is also possible to have a bone-anchored hearing aid permanently implanted. The most sophisticated of all work through digital technology. Most importantly, once you have a hearing aid, if you have any problems you must tell your GP or specialist. It will help if you can use it properly, and if you ask you should get the help you need.